Well, one spare human foot, lots of tortoises, an eagle's wing, and a shaman (conjectural). 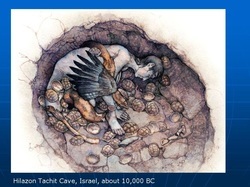 These were all carefully placed in a well-constructed grave dug around 13,000 BCE in a cliff shelter at Hilazon Tachit in Israel. The area at the time was wooded and well-watered, as was much of the arc of land from the Levant to southern Anatolia to Iraq. This is the area shared by the ancestors of all the key food plants and farm animals that have underpinned western civilisation. The people that buried the Shaman-lady were living in small villages, hunting and foraging for food. However they were gathering high-carb grass grains in large quantities - the ancestors of wheat and barley. Their way of life was ended, possibly by a major drought, so they didn't become the first farmers. But a mere 5,000 years later (!) growing food, keeping tame animals and living in one place had been adopted in many places across the Levant and southern Anatolia. The Neolithic Period had arrived.